Michael Collins, faculty director of the Center for Financial Security at the University of Wisconsin, identified another issue: young adults in debt are in a more precarious financial situation. When life’s inevitable disruptions do hit, it becomes more difficult to keep up with financial obligations. But a report last week by the Pew Research Center indicates the debt problem may not be as bad as some fear. It shows that debt overall for young adults has actually fallen over the past decade, indicating that outsized student loan balances are confined to only a segment of the population. Households under the age of 35 had $17,938 in debt of all types in 2001. It spiked to $21,912 in 2007 and fell to $15,473 in 2010, according to Pew’s study. Pew’s study did find that the composition of their debt is changing dramatically. Student loans are a growing share of young adults’ debt, and mortgages are a smaller share. Yet Richard Fry, a Pew senior research associate, wasn’t troubled by that and put it in perspective. He noted that the median student loan debt for households under 35 is a manageable $13,410. That compares with the $128,000 median mortgage for those young adults who own a house. Ohio State’s Dunn uncovered another issue: this generation is paying their debts at a slower pace than prior generations. The problem may come when they are in their mid-40s. That’s when families reach their peak borrowing years and life really hits: kids in or closing in on college, a big mortgage, and 401(k)s begging for more. Dunn estimated that when young adults born between 1980 and 1984 reach age 45, they will have nearly $11,000 in credit card debt – their parents had about half that, or about $5,200 at 45. What will young adults face when they reach their peak debt years? And what implications will this have for when they retire? Readers, what’s your perspective on the changing debt situation for young adults? Feel free to post a comment on our Facebook page. 4 Responses to Millennials in Debt: Is It a Big Deal? You have raised a good point. Most students and young adults couldn’t go through the complete registration process. Even after applying for the loan, they do not even try to read FAQs and other important documents. Young adults should understand and know how they will pay a loan back. I think the best way to solve this problem is to lower interest rates on student loans. In this economy it’ll be extremely hard for some students to pay back those big loans. Student loan debt, according to some analysts, is the next bubble to burst. The cost of a college education has continued to grow much faster than wages. 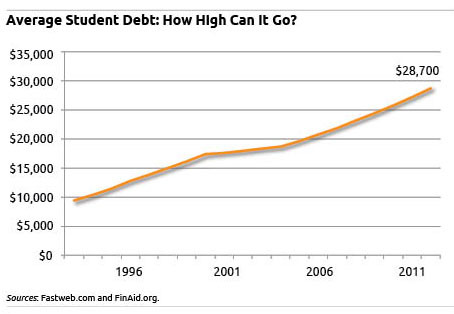 As a result, student loan balances have skyrocketed with no way of paying them off once deferrals have run out. It’s a dangerous situation. Informative post! You have a good points in your article. I honestly think that student loans are frustrating because they have to work double time to pay them. Thank you for this information. I’m looking forward for more interesting posts from you.